5 Minutes for Books reviewer Elizabeth is here to share about the latest Jane Austen movie in this sponsored post. Lady Susan is one of Austen’s unforgettable characters. Sharp-tongued, witty and intelligent, charming to men and annoying to women, she lives off her rich friends and relations, drifting from one house to the next. Her poor daughter has run away from her expensive boarding school, and her mother is determined to make her marry well–and find herself a new husband to boot. Lady Susan was one of Austen’s early creations, coming to life through a series of letters that compose a short novella which was never published in Austen’s lifetime. In fact, the title of the novella, Lady Susan, is itself a later creation. Now, the character is finding new life in Whit Stillman’s Love & Friendship, opening in select theaters this week. Buy your tickets at Fandango right HERE. Jane Austen’s work has long been fertile ground for movie-goers’ imaginations, but screen adaptations usually work best when the director uses his or her own imagination to recreate the scenes, thereby ensuring their timelessness. The reviews for Love and Friendship so far are terrific. David Edelstein, in his review on NPR’s Fresh Air, went so far as to say it’s an improvement on Jane’s original. Starring Kate Beckinsale, Chloe Savigny, Xavier Samuel, and Stephen Fry, the film’s comedy of manners is a delight. The combination of Austen’s memorable dialogue with the formality of the times and a witty and intelligent comedy make a fantastic movie-going experience! To celebrate the new release, one lucky reader will receive a prize pack. Thanks to Roadside Attractions for this offer. To enter, please use the widget below. Great blog high in awesomme information, I really hope you doing your task. All i want to declare I’ll back for worthly information from you. remarkable if you’re serious. Plenty is of great pornstars plus much more for you. View you next time i assure i leave more comments for you. en el buscador de Google, era algo que siempre y en todo momento me interesó. I am looking forward to this one because I heard it was great. My favorite movie adapted from a Jane Austen novel is “Mansfield Park” -1999. Pride & Prejudice is my favorite novel. I’m looking forward to the costumes in this. My favorite Jane Austen novel is Pride and Prejudice. The movie Emma was my favorite. So charming! I have to be honest, I’ve never really been a Jane Austen fan, but the promos for this movie have intrigued me. The main character seems to be a bit more, shall we say lively? then what I expected. The banter they’ve shown in the trailers has been amusing. I like Pride and Prejudice the best. Pride and Prejudice is my fav. Pride and Prejudice was one of my favorites. I love so many of her books so I know I will love this as well. My favorite is definitely Pride and Prejudice! Sense & Sensibility is my favorite. The cast would possibly make this one my new favorite. What is your favorite Jane Austen book or movie, or what makes you look forward to this one? Book, Mansfield Park, movie, Clueless. I am looking forward to this movie for many reasons but a big reason is the babes, Kate Beckinsale is a hottie. This will be my first experience with this author. It looks very good!! I think my favorite would be Sense and Sensibility. My favorite Jane Austen movie is pride and prejudice. Pride and Prejudice, both the book and the approximate dozen movies of it. Emma has always been my favorite. I’m pretty excited about Lady Susan on the big screen! i read it a long time ago, but it always makes me enjoy the book more when there is a movie to help explain the generational differences. I didn’t like Emma until the Gwyneth Paltrow movie, it helped me understand the confusing parts & now I love reading the book, so hopefully Lady Susan will do the same for me. my favorite book is Pride and Prejudice. I love the movie too! Persuasion is my favorite, although Pride and Prejudice is high on the list also. I have never heard of this one, and it certainly sounds interesting enough to watch. I loved reading Pride and Prejudice. I like Pride & Prejudice. My favorite Jane Austen book and movie is Pride and Prejudice. I’m not really a fan of Jane Austin, but I watched the clip of this movie and I like it. It seems fast paced and has smart humor. I remember seeing Pride and Prejudice in college. I loved it! 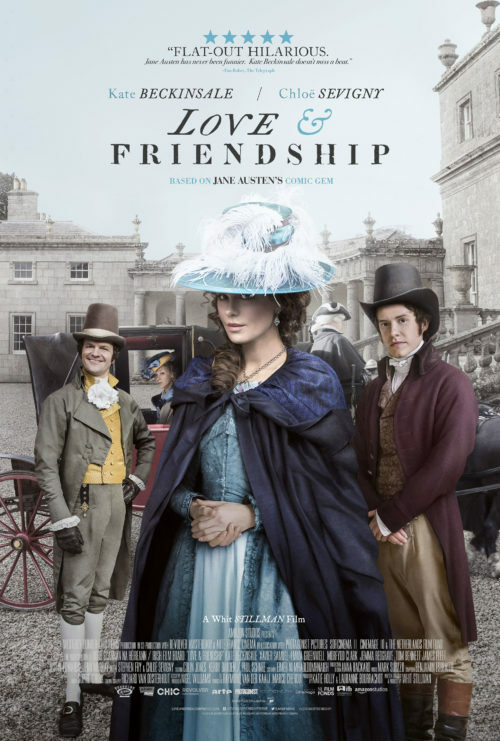 I look forward to seeing Love and Friendship because I have enjoyed all the other Jane Austen film adaptations, especially the BBC miniseries. I love the costuming and the English countryside you see in the films. I was actually unaware of Love and Friendship so it is a nice surprise to find a “new” Austen. I am looking forward to seeing this one because the cast looks so good. Those women are so beautiful and mediveal looking. I don’t really have a favorite that I can think of but she is a great human being. I love the gift card option on this! I’m looking forward to this b/c I get to see it with my sister. I’ve always liked Sense and Sensibility. I have been a Jane Austen addict since college. I read Pride & Prejudice and I was hooked. I’ve read all of her books at least once or twice and I’ve seen every movie adaptation since the 90’s. I can’t wait to see this!! Sense and Sensibility has always been a favorite of mine. My favorite is a toss between “pride and prejudice” and “Sense and Sensibility”. My favorite books is Pride and Prejudice. Pride and Prejudice would be my favorite of them all. Sense and Sensibility is definitely my favorite, but Lady Susan was the first of hers that I read in a Jane Austen class back in college. My favorite Jane Austen book and movie is Sense and Sensibility. My favorite is Sense and Sensibility, both book and movie. I’m looking forward to seeing this one because it’s the perfect movie for a girl’s night – dinner and movie with the girls! My favorite Austen book is Sense and Sensibility. This movie sounds nice. Our favorite is Emma but Pride and Prejudice is a close second. I enjoyed Sense and Sensibility! My favorite book is Pride and Prejudice. My favorite film adaptation of Pride and Prejudice is also the one with Keira Knightly. Pride and Prejudice is my favorite Jane Austen book and I have read all of her books. My favorite Jane Austen version of the movie is Keira Knightley playing Elizabeth Bennett. Persuasion is my favorite Jane Austen book! Sense & Sensibility is my favorite. i love pride and prejudice. I look forward to this one too. I love Pride and Prejudice! I really love all her books too. Thanks for the chance! My favorite movie based on Jane Austen’s book is Sense and Sensibility. My favorite Jane Austen book and movie is Persuasion. I am really looking forward to seeing this movie because I think Whit Stillman is a great director and he will have an interesting take on Austen. I enjoyed Emma from Jane Austen as well but this one, Love and Friendship looks like it is going to be a great one too. My favorite one is pride and prejudice. I would have a hard time picking a favorite… My favorite movie is Sense and sensibility. I love all the Austen I have read. Pride and Prejudice is my favorite, but it’s the only one I read. My favorite Jane Austen book is Pride and Prejudice. Thanks for the giveaway! Pride and Prejudice is my favorite. Thank you! Pride and Prejudice is my favorite novel. My favorite Jane Austen is Sense and Sensibility. Love & Friendship looks Austen worthy! I haven’t ever read/seen Jane Austin but really need to in order to round out my education. This looks like a great way to start! I like Pride and Prejudice and want to see this film because I know I will enjoy it. My favorite Jane Austen movie is Pride and Prejudice. I’m excited to see this movie because Kate Beckinsale is one of my favorite actresses and this movie looks fantastic! My favorite Austen book is “Mansfield Park”, and my favorite adaptation is the 1995 “Pride & Prejudice”. Would love to see how this earlier work of hers stacks up against her more mature work. I love Austen. I think I may have even before it was fashionable. I have read ‘Sense and Sensibility’ at least five times, so that must be my favorite. I like the BBC version of ‘Pride and Prejudice’ with Colin Firth best. I have to say that Sense and Sensibility would be my favorite. Difficult to choose one favorite…love them all, but maybe Emma would be my favorite. 🙂 Thank you. I’m an English teacher so I love all things Jane Austen…..but Pride and Prejudice can’t be beat. Sense and Sensibility is always fun. I love that one. My favorite is Pride and Prejudice. I am looking forward to this movie as I love period piece movies. This movie looks surprisingly funny. I like the movie Emma too. I liked Pride & Prejudice. I also really liked Pride and Prejudice and Zombies. That was a hoot! I think Sense and Sensibility is my favorite. I look forward to this for a new Jane Austen story to love!! Pride and Prejudice is my favorite book and movie. Pride and Prejudice is my favorite. I will ove this because I love stories with settings in England, or of long ago. Pride and Prejudice is a long time favorite of mine. My favorite is Pride and Prejudice. Looking forward to this movie, I’m going to see it this Sunday! My favorite is Pride and Prejudice. I also liked Sense and Sensibility. Pride & Prejudice is my all time favorite and the trailer looks good for this movie – can’t wait to see it. My favorite Jane Austin is Lady Susan. My favorite Jane Austen is Sense and Sensibility, and I can’t wait to watch the humor in this one! Sense and Sensibility is my favorite. I like Emma and the TV movie Emma with Jonny Lee Miller is my favorite! Pride and Prejudice is a favorite of mine! Pride and Prejudice has always been my favorite! My favorite Austen book is Emma and my favorite movie is Pride and Prejudice. My favorite Jane Austen movie is The Jane Austen Book Club. Pride and Prejudice is my favorite. I haven’t read this one yet. I want to though! Pride and Prejudice is my favorite novel! My favorite Austen book is Sense and Sensibility. This movie sounds like a nice one, can’t wait to see this. My favorite Austen book and movie is Pride and Prejudice. I love Sense and Sensibility . Pride and Prejudice is my absolute favorite. Sense and Sensibility is my favorite Jane Austin novel. I love the pride and prejudice book!